Omsk Scientific Bulletin. Series «Society. History. Modernity» is published by the Flagship University of the Omsk region scientific peer-reviewed journal of academic research on the scientific areas of «History», «Philosophy», «Economics». The editors support interdisciplinary research by publishing their results. 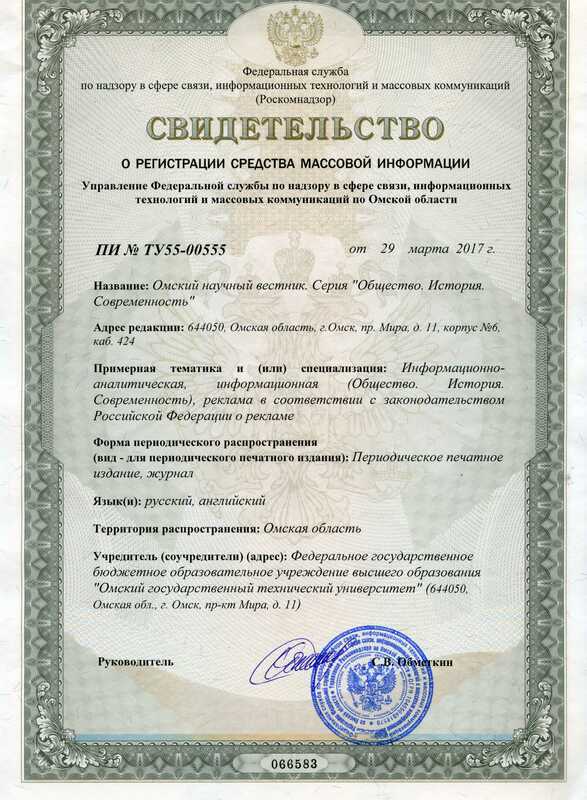 Accepting materials on the declared scientific directions, special attention is paid by the editors of the journal to the processes of historical and socio-economic development of Omsk Irtysh Land. The journal publishes original research articles, as well as interviews with famous scientists who visited Omsk; scientific reviews/analysis; translation of works of foreign specialists with commentary articles to them; historical sources with commentary to them. The publication is aimed at researchers and university professors, graduate and doctoral students, local historians, as well as a wide circle of readers interested in various topics in the field of modern humanities and socio-economic sciences. The edition is included in the catalog «Newspapers. Journals» of the «Federal Agency on Press and Mass Communications». The Publisher of the journal is federal state budget educational institution of higher education «Omsk State Technical University». Periodicity in 2016 — 2 issues per year. Since 2017 — 4 issues per year. The journal considers its main mission as forming a broad discussion and communication platform among researchers working in the field of humanities and social and economic sciences today. Special attention is paid by the editors of the journal to the processes of historical and socio-economic development of Omsk Irtysh Land. 1. Publication of the results of independent and original research, thematically related to the field of «History», «Philosophy», «Economics». of humanities and socio-economic sciences through a network of interdisciplinary dialogues. 3. Involving young researchers and teachers in the scientific life and professional community. 4. Assistance to development of the institute of independent scientific expertise and the formation of the expert community in the field of humanitarian and socio-economic sciences. 5. Formation of a corpus of scientific materials in the interests of development of the educational process in the field of humanitarian and socio-economic sciences. Series «Society. History. Modernity» had been an integral part of the journal «Omsk Scientific Bulletin» (ISSN 1813-8225) until 31.12.2015. From 2007 to 2015 more than 50 issues of this series were published. Information and archive of numbers — on the official site http://vestnik.omgtu.ru/. Since 2016 the journal is published as an independent periodical. Editorial board of the journal Omsk Scientific Bulletin. Series «Society. History. Modernity» invites interested authors to submit their materials for consideration of them for possible publication. Both Russian and foreign researchers are invited to cooperate. Scheduled admission of articles for the first issue of the 2019 — until January 11, 2019 (planned publication of the journal — February 2019). Scheduled receipt of articles for the second issue of 2019 — until March 29, 2019 (planned publication of the journal — May 2019). Scheduled admission of articles for the third issue of the 2019 — until June 14, 2019 (planned publication of the journal — September 2019). Scheduled receipt of articles for the fourth issue of 2019 — until October 21, 2019 (planned publication of the journal — December 2019).